Home|Resources|Fundraising Blog|Giving Tuesday Is Coming! Giving Tuesday falls on November 28 this year and is one date all nonprofits should have circled on their calendars. If you don’t already, we suggest you circle it now. Then consider implementing some strategies that will help you capitalize on this major giving day – while you still have time. For those of you who have yet to be sold on the concept, the numbers don’t lie. Giving Tuesday stands as a major revenue booster for nonprofits, and it continues to increase in effectiveness each year. In 2016, Giving Tuesday saw a 44% increase in donations, resulting in an estimated 1.56 million gifts. Revenue grew from around $116 million to $177 million. The average gift was $107. Beyond this, organizations saw 2,399,000+ social media interactions generated around their campaigns. This means that supporters were not just donating, but also sharing their contributions with friends and interacting with Giving Tuesday content. These were driven by 1.5 billion media impressions from about 15,000 participating nonprofits. With such impressive growth over the last 5 years, Giving Tuesday has proven to be a valuable fundraising opportunity for nonprofits in the US and around the world. Yet, we still see some organizations that do not account for this day in their yearly fundraising strategy. To combat this, Allegiance Fundraising put together a list of several Giving Tuesday ideas and best practices. You can think about adding these to your bag of tricks before you head out for Thanksgiving break. If you want your organization to be discoverable to potential new donors online, it will behoove you to put your organization on the official Giving Tuesday website directory. This registers your organization as an official Giving Tuesday participant, making your organization discoverable to those searching for nonprofits in their community. This also provides an additional level of trust to those who may not know you. For many donors, this may have been one of the few donations they made in the last year. And often, the only donation they made to your organization. These are your high-value targets for this day. Email them as a reminder of the gift they sent last year and explain how much Giving Tuesday donors, like themselves, helped further your organization’s mission. If you have new messaging you would like to try out, or a new donation page design. This is the time to test it before the end of the year. Giving Tuesday is likely the biggest push you will see before your crucial end of year campaigns, and it provides a perfect opportunity to test new end of year creative. Instead of optimizing EOY campaigns as they happen, Giving Tuesday provides fundraisers the ability to capture this extremely valuable data beforehand and use it to improve their end of year campaigns. Depending on where you host your donation page, this should be a relatively simple and effective task. Creating unique donation pages should be one tactic you apply to all major campaigns, but it is crucial when you are focusing on one specific offer or message. Consider creating a Giving Tuesday donation page that explains the value of this day to your organization, specifically. This is a major giving day that helps many nonprofits meet their goals to keep operating. On top of this, Giving Tuesday was designed to help create a sense of urgency for prospective donors; they only have one day to contribute to the campaign, and your messaging should leverage this. For integrated campaigns, the imagery and messaging found on your donation page should match what is seen in your ads, emails, or direct mail to create a consistent theme. A poorly planned donation page can make or break a campaign. The hard part is driving prospective donors to your page. Once they are there, fundraisers need to be conscious of whether they are providing an experience that makes it easy to donate. This means having a mobile-optimized page with no unnecessary field or information, and providing an experience that is similar to what donors have interacted with before – whether that be media ads, emails campaigns, or direct mail pieces. As the official website puts it, “#GivingTuesday is a global day of giving fueled by the power of social media and collaboration”; meaning, Giving Tuesday campaigns are most powerful when people share their contributions with the world. The post-donation thank you is the biggest chance organizations have to convince their donors to share their contribution. This is a major step in the donor journey, and the moment they should feel most proud about making their contribution. Here, it is the organization’s job to make them feel appreciated and valuable. This means explaining the real value behind their gift. They are not a transactional customer; they did not make a purchase. Instead, they saved a life, transformed their community, or changed the future. Make this clear to them and ask them to share their good deed with their followers. By doing this, they are only helping to do MORE good. Enticing your donors to share their contribution is the best way to generate additional organic results. There’s nothing more powerful for your organization than a brand advocate, but getting donors to tout their support is not always the easiest thing. That’s why it is our job to make it simpler for them. Create a unique hashtag that your followers can use to promote your campaign. There are already several hashtags associated with Giving Tuesday; use these to demonstrate to your donors that they are part of something bigger and ask them to share their #Unselfie or #MyGivingStory. The #Unselfie is one tactic that has garnered a lot of popularity over the last few years. Here, organizations ask donors to share a selfie and their reason for donating. This is a good way to generate additional organic results for your campaigns. Nonprofits should consider capitalizing on this trend by providing PDFs that donors can print out and share. Providing these pre-made forms puts the opportunity in the donor’s hands and makes it less of a “hassle” for them to share. If your thank you email is well written, this should be the moment your donor is most proud about his/her donation, and should be leveraged accordingly. Tip: Individuals who take this extra step to promote your organization online, should also be classified in your CRM system as brand advocates. 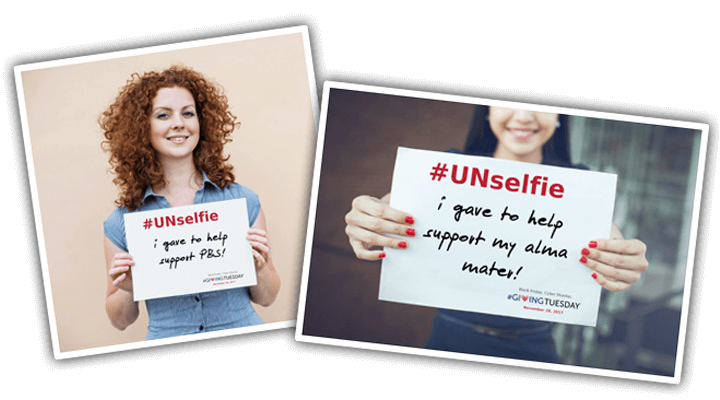 This also provides an opportunity to match the gifts of anyone who shares an #Unselfie. Though not necessarily a traditional tactic, Giving Tuesday should be part of any modern-day fundraiser’s lexicon. Over the last several years, organizations at international, national, and local levels have been able to generate large amounts of additional revenue by capitalizing on the spirit of this day. We hope you take the time to consider some of these tactics and add them to your Giving Tuesday strategy while there is still time. If you have any questions on how to further leverage Giving Tuesday for your nonprofit, please reach out to our team today.